This is a great resource for translators working with French and English – the Canadian Department of Justice has published individual factsheets or “records” for terms that have been the subject of legislative harmonization between the common law and civil law systems. The records include many legal concepts (one of the trickiest things to translate 😉 ) so I think it’s really useful. Below is an extract from the “rationale” for the initiative. You can find the whole thing, including the relevant laws, here. In some cases, the same terminology is used in both common law and civil law (example: acquisition/ acquisition). In other cases, different terms must be used to reflect the concepts of each legal system. For example, the terms “pre-trial pecuniary loss/perte pécuniaire antérieure au procès” have been used for the civil law, whereas the terms “special damages/dommages-intérêts spéciaux” have been used in common law. Generally, in provisions where a legal concept is expressed using distinct common law and civil law terminology, the common law term appears first in the English version and the civil law term appears first in the French version. For example, the terms “real property” will be followed by “immovable” in the English version, and the term “immeuble” will be followed by “bien réel” in the French version. In certain cases, a concept in one legal tradition has no corresponding concept in the other. When this occurs, the note “n/a” (not applicable)/”s.o.” (sans objet) will appear next to the legal system that does not have the corresponding concept (for an example, access record on equity). Here is the link to the Bijural Terminology Records Research Index. To change languages, click on the left-hand side of the green banner at the top. From the Canadian Department of Justice, terms that have been subject to legislative harmonization between the common law and civil law systems. Thank “From Words to Deeds” for the tip and extract. 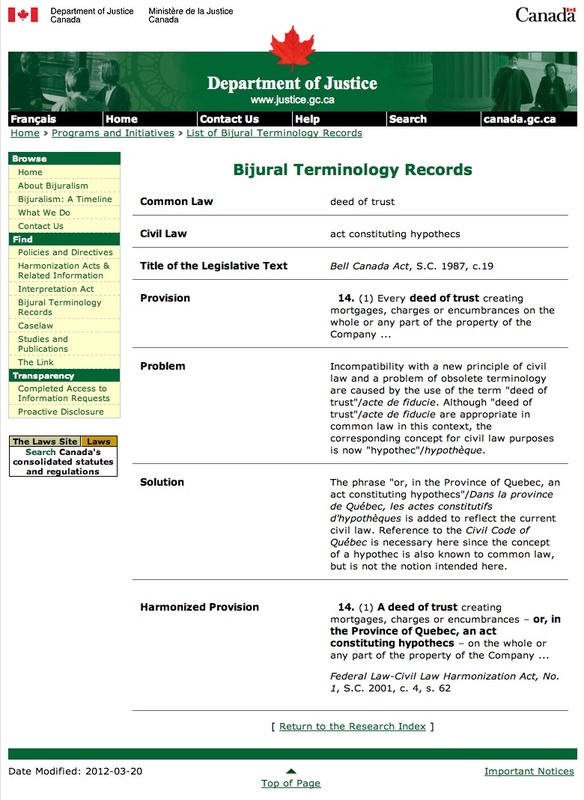 Pingback: (EN)-(FR) – Bijural terminology records | wordstodeeds.com | Glossarissimo! This is a really useful resource but translators working from/to non-Canadian French need to be careful. It is always necessary to exptess the “reality” of the legal system of the country to which the source text relates. The fact that Canada has “harmonis(z)ed” its terms doesn’t mean that any other jurisdictions have done so. As with all resources, this should be a guide. Absolutely Chris – and thanks for underlining that.